A popular appetizer menu at Izakayas and Japanese restaurants, Agedashi tofu is crispy deep fried tofu served in flavorful tsuyu sauce with grated radish, green onion, and bonito flakes as toppings. If you don't mind deep-frying, this tofu dish is incredibly easy to make at home. Wrap the tofu with 2-3 layers of paper towels and place another plate on top. 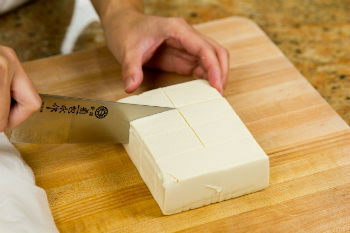 Drain the water out of tofu for 15 minutes. Peel and grate the daikon and gently squeeze water out. Cut the green onion into thin slices. Put dashi, soy sauce, and mirin in a small saucepan and bring to boil. Turn off the heat and set aside. Heat the oil to 350F (175C) in a deep fryer or medium saucepan. Coat the tofu with potato starch and deep fry until they turn light brown and crispy. Remove the tofu and drain excess oil on a plate lined with paper towels or wire rack. 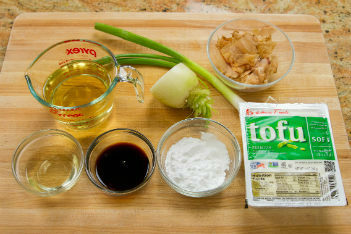 To serve, place the tofu in a serving bowl and gently pour the sauce without wetting the tofu. Garnish with grated daikon, green onion, katsuobushi, and shichimi togarashi. 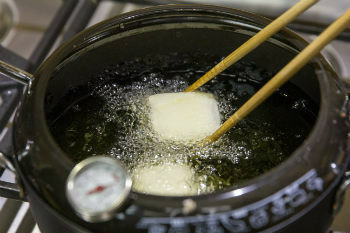 Tofu: If this is your first time making Agedashi Tofu, use medium tofu instead of soft tofu since it's easier to cook without breaking it. 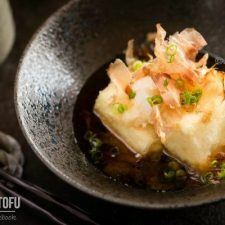 Once you're more comfortable making Agedashi Tofu and prefer silky tofu texture inside crispy outer layer of Agedashi Tofu, use soft tofu. 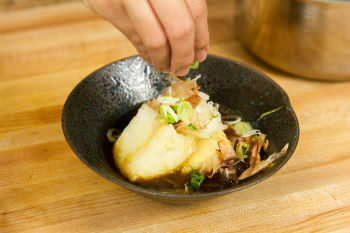 For vegetarian agedashi tofu, use kombu dashi.